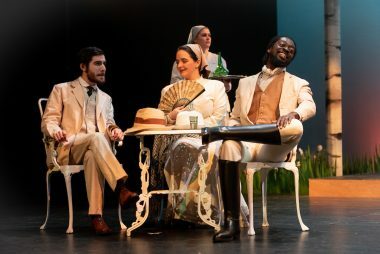 CHRISTOPHER Hampton’s 2007 adaption of Anton Chekov’s The Seagull – a classic tale of unrequited love and the bohemian antics of ‘those theatricals’ – is an excellent choice for inclusion in this Crescent season. It has freshness to it and Hampton makes the text ‘blossom’ not ‘get lost’ in his translation. Chekov, unlike many of his contemporaries, wrote great parts for women and in The Seagull they are there for the taking. 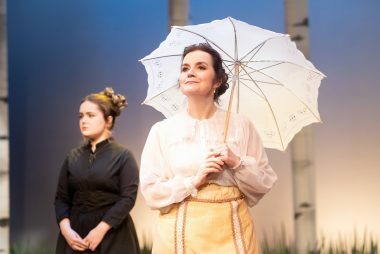 Karen Leadbetter plays Irina Arkadina as a gloriously affected actress and self-centred woman who treats others as mere trappings, except that is for her son for whom she shows a fondness but not exactly motherly love. Hannah Birkin as Nina drives the would be-actress and writer groupie with a joyous passion that leaps across the curtain line and takes us with her on her journey of naivety, search, disillusionment and finally tragedy. 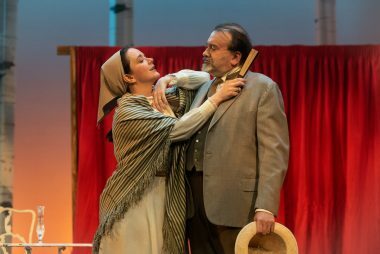 In the opening scene Nina has to endure ridicule as she is forced to perform a piece of gibberish written and produced by Irina’s son Konstantin on a stage specially erected by the lake on the Sorin family estate. Konstantin, who is in love with Nina, brings down the curtain in anger and humiliation at the audience reaction. He is played with believable intensity by Jacob Williams offering us a neat ‘Noel Gallagher of his time’ approach to his work. Here is a troubled writer, who knows deep down he lacks the talent to pursue a literary career. Really his mother should be telling him to join the Russian army or something where he could let the adornment of a military frock give him the admiration he craves. Instead he is destined to alienate those around him so that they chose to avoid him whenever possible. Nina tires of Konstantin’s teeth grinding shenanigans and becomes attracted instead to her mother’s lover, the successful writer and unwitting libertine, Trigorin – he is played with a gentle modesty by John O’Neil who gets my heads up for the best speech of the first half when he beautifully describes the obsession that is unique to writers and is both their drive and their nemesis. Within the male cast two stand-out performances are given by Colin Simmonds and Dave Hill. Simmons plays the Doctor, Yevgeny Dorn by name and delivers his lines like gentle waves lapping your toes on a warm beach. 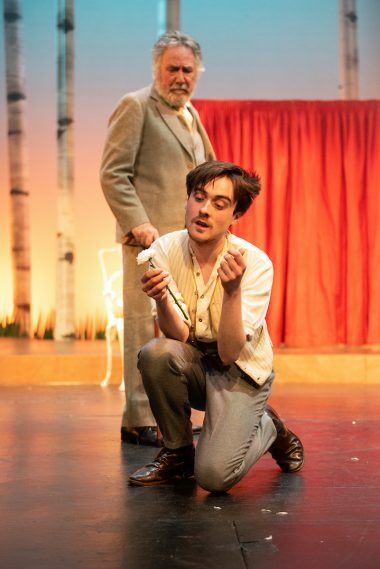 Hill plays Sorin as your favourite old uncle – both actors offer up a master class in the use of pace and space. The major roles are well-supported by the minor – non moreso than John McErlean who brings a’ Stan Laurel’ moment to that art of opening a door whilst holding a bevy of suitcases and a fishing rod. Director Andrew Brooks undoubtedly understands the text but there are times when his action needs refinement. It is sometimes uncomfortably bunched together. He is not helped by an over large acting space to fill and a set and lighting which doesn’t quite gel together. Generally it is too bright and too white. I wanted to see people emerging from shadows and dark places which harmonise with the way the story peels away layers as we travel from frivolity to tragedy. The sound effects were excellent including a wonderful storm. Undoubtedly this production is well worth braving the cold night air for. 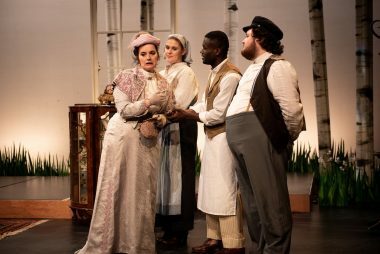 If you’re new to Chekov you’ll find it’s very accessible and if you’re a Russian romp aficionado then you’ll enjoy the passion this production offers in abundance. 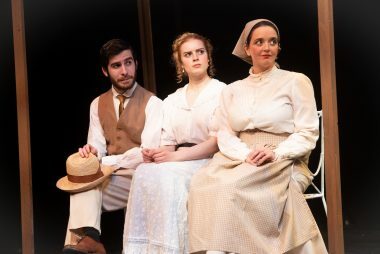 The Seagull runs at The Crescent Theatre, Birmingham, until Saturday, February 9.